Many casino slot games focus on gods and heavenly beings. After all, they are supposed to reward us in the afterlife, so why shouldn’t they reward us now with earthly riches as well? 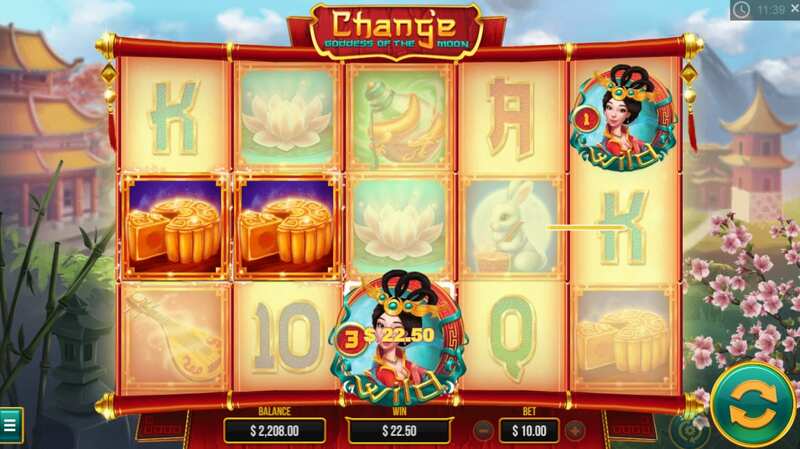 Well, the Chang’e Goddess of the Moon slot looks to Chinese culture to take its spiritual inspiration. Chang’e is the Chinese goddess of the moon and this artful game brings her story to life. Meet her in China to see if these Oriental reels will be lucky for you. Click here to find out more about Wizard. 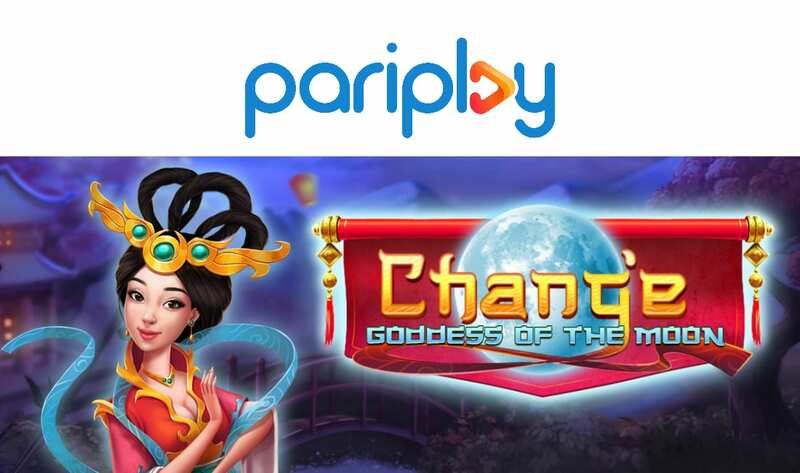 Pariplay is the team of developers behind Chang’e Goddess of the Moon, and add it to their other titles, including Fire Vs Ice the Eternal Battle and The Three Stooges Disorder in Court. The company describes itself as a new-age multi-channel gaming business, and they’ve used this modern mind set and creative way of thinking to come up with something new and engaging. Chang’e Goddess of the Moon shows just how exciting these engaging games from this forward-thinking company can be. Play slots by PariPlay! The oriental background music should put you in the spirit of things. If that doesn’t work, then the elegant backdrop to the game board certainly will. You’ll see beautiful pagodas, regal temples, and pretty pink orchid flowers. You’ll certainly feel like you are in Asia! On top of this background are the five reels and twenty pay lines. All of the symbols are also Chinese-inspired and a few iconic images from the country’s culture and folklore pop up. Letters of the alphabet and the letter ten are the lower-value symbols. They might not worth much, but they can still help you win. However, it’s the picture symbols that come with the higher values. These are portrayed by rabbits, slices of Chinese-style moon pies and lotuses. 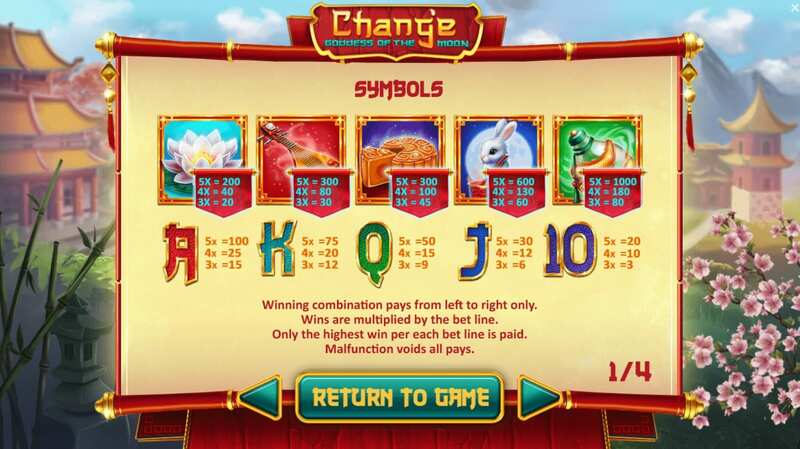 Out of all the picture symbols, the small potion bottle comes with the highest value.There are also some great bonus features that could help you fill up your jackpot. · WILD SYMBOL – The female character is the Wild symbol of the game. She can end up on any of the reels and will be locked on the symbol for two to five spins. · FREE SPINS – If you are able to spin three or more of the archers then you will unlock some free spins. For three archers, you’ll get between ten and twenty freebies. Four bring twenty-one to forty extra goes while five archers bring a whopping forty-one to fifty.